Barely two months into his new job as a Prime Minister, Dr Abiy Ahmed has managed to simultaneously excite and alarm pretty much everybody. In Ethiopian political leadership, this is no small feat, where offending the public has been the norm than the exception. During his judiciously sequenced marathon cross-country check-up, he delivered a cautious message in the west while hitting a conciliatory tone in the east. In the capital, Addis Abeba, he forcefully challenged the youth and business owners to â€œdo their fair share.â€� Yes, his bid to steer away from the political landmines got him some troubles, generating an instant fury on the front lines of social media, but many seem to get over it quickly. Perhaps the most drastic of all changes so far is the announcement on Tuesday of the two major policy shifts: Eritrea and the economy, which need separate reflections. All of these happened in just two months. Of course, it is not yet the same as Leninâ€™s â€œthere are decades where nothing happens, and there are weeks where decades happen.â€� However, given the fact that a few months ago the country seemed on the verge of catastrophe, incremental as one might think of these changes, the steps the new prime minister endeavors are laudable and praiseworthy. Abune Teklehaimanot became the Patriarch of Ethiopia on this date, August 31, 1976. Ethiopian Review posts this article in remembrance of this great Ethiopian religious father. Abune Teklehaimanot’s name until he became patriarch was Mekuria WoldeMichael. He was born on September 18, 1917, in a small village called Wotebet located in Amanuel District of Debre Markos Town in Gojam Province. His father’s name was WoldeMichael Wondimu and his mother’s Zewditu Kassa. When Mekuria came of age, he joined the Orthodox Church school in the area run by Merigeta (which means “mentor”) Begenaw Wassie. There he learned the Amharic alphabets, to read the Psalms, and to write. He also studied the church music called Wazema. When he had finished studying under this mentor, he went to Gojam’s Bichena District to a church village called Yerez Saint Michael and joined the school led by Memhir (“teacher”) LisaneWork and studied Qine. When he was sixteen years old he left for Sidamo Province and settled in Wolayta District at Sodo (Southern Ethiopia). There he met a virtuous hermit monk called Desta at the Wolayta Sodo Debre Menkirat TekleHaimanot monastery. Before Mekuria’s arrival, this monk had prophesied to the monks that a great hermit would soon come to the monastery. At this time Mekuria changed his name to Melaku because he did not want to be discovered by his relatives, who might try to bring him back to his village. At the monastery, he started to help Hermit Desta by bringing him water and dry food to keep him alive. When his mentor died he replaced him in the monastery and continued his mentor’s work. He was responsible for teaching the people and building schools in the area. The Wolayta people loved and respected him as a father and they obeyed him. He led a life of purity and never begged for a living. He raised money to build many churches and schools in the area. The people’s contributions were the main source of income for these churches and schools. When the Derg regime took over the government of Ethiopia, Aba Melaku was denied the necessary income to run the institutions because the laws had changed. So he went to Addis Ababa to get money and tabots (duplicates of the Ark of the Covenant) from Patriarch Tewoflos at the Ethiopian Orthodox Church headquarters to supply the most recent churches he had built. He was given two out of five tabots he requested and was told to return later for the other three. Aba Melaku arrived in Addis Ababa on the day of his appointment to see Patriarch Tewoflos but, little did he know, the patriarch had been forced to leave his position and was under arrest. The main office had established a committee to find a replacement. Aba Melaku went into the office of the president of this nomination committee and gave him the traditional greeting of respect. As director and chairman of the board of the Ethiopian Orthodox Church office, Dr. Kinfe Regib, who was earnestly seeking a hermit monk as a nominee for the election of the next patriarch, was very happy to see Aba Melaku walk into his office as if driven by God. Dr. Kinfe Regib asked him the cause of his visit. When Aba Melaku told him that he had an appointment with Aba Tewoflos, he was told that Aba Tewoflos was away for a while and would meet with him at a later date. In the meantime, Dr. Kinfe Regib asked if he was willing to answer a few questions about himself, his job, and his responsibilities. Aba Melaku agreed and gave him the details he wanted. 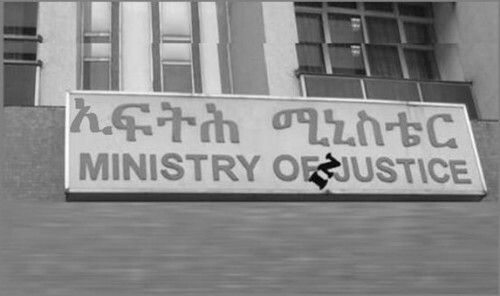 Aba Melaku told the chairman that he had built sixty-four churches and twenty-four schools–all this without any salary from the Ethiopian Orthodox Church central administration office. When asked where he was born, he answered: “For a monk, is there any particular place? Any spot of Ethiopia where I live is my country.” He refused to identify his birthplace out of principle. Dr. Kinfe Regib, amazed by the divine providence that had brought him there, took notes on him and put them in an envelope. He then asked Aba Melaku to take the envelope to the main nomination committee secretariat office outside the office where they were meeting. So Aba Melaku obediently took the envelope and delivered it to the secretariat office but he had no clue what was going on at the time. The person in charge took the letter and opened it. Seeing the contents of the mysterious letter, he looked the monk over very carefully and then allowed him to leave. The next morning Aba Melaku returned to the main office hoping to meet with the patriarch only to discover that he was no longer in charge and had been detained by the government. Shocked, he immediately returned to Wolayta. Soon after that, short profiles of two bishops and three monks, Aba Melaku included, were published and distributed in Addis Ababa. Everybody who read the short biography of Abba Melaku was touched by his personality. Soon everyone knew his name and was talking about him. On the day of the election, Aba Melaku was elected patriarch by a very high number of voters. Up until that day, he had followed his routine lifestyle of praying, fasting, serving the church, and teaching his followers. Suddenly, he was ordered by the governor of Wolayta to go to Addis Ababa and report to the main church headquarters. He left immediately not knowing what the rush was about. This took place in July and August of 1976, and until the final day of celebration, Aba Melaku spent his time in prayer with others praying for him as well in St. Mary Church. They tried to persuade him to change his clothes and wear shoes but he refused. On August 31, 1976, Abba Melaku was inaugurated as the third Ethiopian Partiarch of the Ethiopian Tewahdo Orthodox Church, taking the name TekleHaimanot. The occasion was celebrated with prayer and special sermons at the Chair of the Almighty Holy Trinity Church in Addis Ababa. Aba Melaku took his place of authority, and for some time continued to receive guests sitting on the Patriarch’s Chair in his common clothes. Later on, his hermit monk friends persuaded him to change his habit out of respect for the Orthodox Church. He finally agreed to wear a cotton cloth dyed yellow with a proper shemma over it and a pair of sandals. Patriarch TekleHaimanot was very well accepted by the Derg regime and was allowed to visit Europe in sandals. He visited Greece, Poland, Austria, Germany, Rome, and Jerusalem. He ate only bread and drank only tea the whole time of his visit. The church people of Europe were amazed at his personality and considered his piety unique. As a result, it is said that the archbishop of Poland, out of respect for Patriarch TekleHaimanot, personally drove him around in a car during his visit to that country, instead of using a driver, in order to witness his piety and partake in his blessings. The Ethiopian head of state, Mengistu HaileMariam, used these visits by the Patriarch as a political strategy to show the West that he was not against religion and had appointed to this important position a person who represented the workers. He also wanted to change international opinion who viewed him as a ruthless tyrant for removing and killing Patriarch Tewoflos when he came to power. As Patriarch Tekle Haimanot was assumed to be have little administrative skills, one of his assistant officers tried to misappropriate church money that was supposed to go to the government. When the Patriarch opposed him, he began to defame him by saying that he was too old, did not know anything about administration, and should be replaced. The Patriarch informed Mengistu HaileMariam of this individual’s unscrupulous behavior and gave him an ultimatum, saying that if this man was not removed from office in three days, no one would prevent him from returning to his monastery. Mengistu immediately removed the officer. The Derg regime’s high government officials, being anti-church communists, asked the Patriarch’s permission to convert several old churches located around the government offices in Addis Ababa into museums. He answered, “these churches are not my personal property for me to give permission, that they belong to all Ethiopian Christians. I will have to discuss the matter with church members and let you know.” This was a smart answer that the officials did not expect from him. Mengistu was aware that this monk is not an easy person to deal with and at the same time knew that if he pushed him harder, he would initiate a clash between the Derg regime and the Christian nation, so he dropped the idea. Thus, as it turned out, the Patriarch was not a person to be pushed bossed around like a puppet. Rather, he proved an able leader of the church for twelve years before he died in 1988. Shortly before he died, the Patriarch went back to Wolayta to start construction on a church building that an outside donor agency wanted to erect. When he arrived, he gave his blessing and set a foundation stone in place. After the ceremony was over, he was ushered to a nice, comfortable residence that had been prepared where he could rest, but he refused to go in. Instead, he wanted to go back to his old hut. He went into the hut and rested. A short while later, he felt a sharp pain and collapsed into unconsciousness. He was brought back to Addis Ababa by helicopter and hospitalized. Shortly thereafter he died at the age of 71. He was buried at the Holy Trinity Church in Addis Ababa.